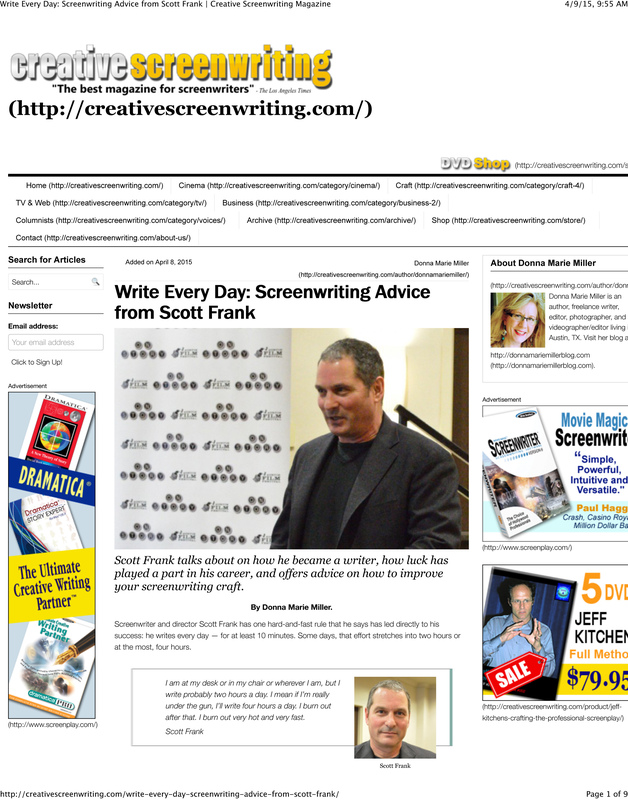 Screenwriter and director Scott Frank has one hard-and-fast rule that he says has led directly to his success: he writes every day — for at least 10 minutes. Some days, that effort stretches into two hours or at the most, four hours. 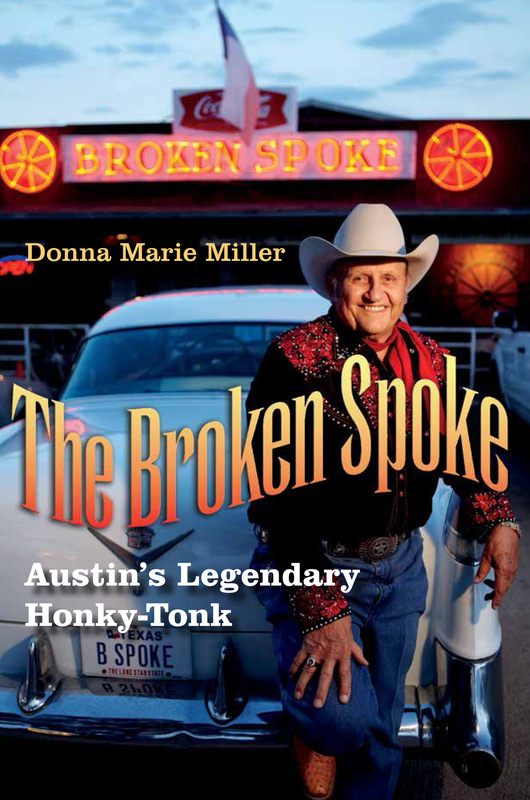 Frank spoke to an audience of Texas screenwriters March 1 at the “On Story” conversation about “Sustaining a Writing Career,” sponsored by Austin Film Festival at Holiday Inn on Town Lake March 1. He shared his insights about how he became a writer, how luck has played a part in building his successful career, and how to improve the craft of screenwriting. He also talked about his upcoming project. Frank has written several original screenplays as well as a string of novel adaptations by crime writers Elmore Leonard and Lawrence Block. He became a director after working as a writer with some of the biggest names in Hollywood such as Steven Soderbergh, Out of Sight (1998); Steven Spielberg, Minority Report (2002); and Sydney Pollack, The Interpreter (2005). Last year he directed A Walk Among the Tombstones, starring Liam Neeson, adapted from Lawrence Block’s novel. During the Iran hostage crisis from Nov. 4, 1979 to Jan. 20, 1981 as a college student attending the University of California Santa Barbara, Frank felt inspired to write his first original screenplay, Little Man Tate. After graduating college in 1982, Frank began to focus writing more about the boy character, Fred Tate. It took eight years before the story became a film project but in the meantime, Frank established himself as a screenwriter. Looking back over 30 years, Frank said he did not have a career plan at 24 years old. He happened to meet someone who had the ability to alter the path of his entire career. “I was very lucky that the first person that I met early on in my career was Lindsay Doran (actress and movie producer best known for The Firm in 1993, Sense and Sensibility in 1995 and Stranger than Fiction in 2006,) for instance. That’s just luck. There’s no reason for it,” he said. He also met late film executive and producer Ned Tanen, best known for Sixteen Candles in 1984, The Breakfast Club, and St. Elmo’s Fire both in 1985. Tanen brought Frank to Paramount and gave him a desk on the studio’s writing floor. While at Paramount, Frank met other writers and movie producers, including Dennis Feldman, best known for Just One of the Guys in 1985, The Golden Child in 1986 and Species in 1995. “One day I wandered into his (Feldman’s) office to play Nerf basketball and I said ‘I have this title in my head and I have no idea what the movie is about. I just like this title, it’s a weird bumbling of words – Dead Again.’ And he said ‘huh’ and by the end of the basketball game I had the plot for the movie,” he said. He worked on the screenplay for over two years before it became the 1991 movie directed by and starring Kenneth Branagh and Emma Thompson. “I’ve made a career – no joke – out of being the dumbest guy in the room. Writers tend to want to be the smartest guy in the room because they don’t want to take anybody’s notes, but if you’re the dumbest guy in the room, you’re surrounded by those people who make your work better and ultimately you get credit for it,” he said. Crucial conversations with influential people have often changed the direction of his screenplays. As an example he described a phone call he received from director Barry Sonnenfeld during pre-production for the 1995 movie, Get Shorty. “Barry (Sonnenfeld) called me up in the middle of the night and he said ‘I think Chili (Palmer, played by John Travolta,) should rent a minivan.’ So I wrote the scene and there was this whole scene with the lady on the bus who calls it ‘the Cadillac of minivans.’ I never would have written that if Barry hadn’t called me up,” he said. Now that he also directs, Frank writes more sparingly and he includes critical visual details in his screenplays. “Now when I write a little paragraph, I think ‘Ok. That’s eight hours of shooting. Do I really want to do that, to be outside in the snow again? How about interior, girls’ locker room, day.’ So you’re constantly thinking about stuff you’re going to make, all the time,” he said. Writers will write better scenes if they think like directors, he said. “Even if it’s two people sitting at a table. It makes you want to make something happen,” he said. Writers should write dynamic scenes as visually interesting as possible and think about who might interrupt, or what unexpected bit of business may occur. “You want to start thinking about these things and you only start thinking about them as a director,” he said. Frank has a reputation for creating compelling openings for each of his screenplays; he uses that same writing device at the start of every scene throughout his screenplays. In order to enjoy a movie, a viewer must be invested pretty quickly. Writers must write their scripts with that rule in mind. “We are also writing for people who read the script,” he said. “Our writing is a factor. Sometimes people write these things when translated are really good, but they read horribly. I would argue that you have to do both, especially early on in your career and especially if you aren’t directing,” he said. Frank said that every scene should answer the same questions three questions. Readers must care about a script’s main characters right off the bat and writers must reveal them as authentic and multifaceted people motivated by passion, Frank said. As examples of solid characters, Frank cited those created for: Raging Bull, the 1997 book written by authors Jake LaMotta, Joseph Carter, Peter Savage and Nick Tosches, and adapted for the 1980 movie by screenwriters Paul Schrader and Mardik Martin. He also likes the characters in Nightcrawler, last year’s screenplay by Dan Gilroy, loosely based upon the comic series by Chris Claremont. Frank also likes writing about men suffering from a serious mid-life crisis. He particularly likes bank robbers as characters. “I’m so glad that I’m not them,” he said. “I have a very boring life and I like it that way. My childhood wasn’t particularly fascinating, but I had a great imagination and I’m very curious. I have weird friends and I know that I collect weird people and I just like that,” he said. He also looks for ways to endear a complex character to his or her audience. “I’m always thinking I just want you to care about this guy. I just want you to care more about her or him in any way that I can to get you there. So by the end (of the screenplay) you have some type of emotional connection, even if it’s a dark, dark story,” he said. Writers must find “the hook” that makes a character interesting. Mistakenly, most writers spend too much time on exposition, Frank said. Drop brief descriptions about the setting throughout the script, he said. “The big mistake people make is they feel that they need to set the scene. So they spend a lot of time in the beginning of their script setting the scene – telling what the apartment looks like, introducing you to their kids and their dog and their car and their life,” he said. A screenwriter entertains; he does not explain, Frank said. Frank created the tone for his movie, Walk Among the Tombstones, loosely based upon the tenth book in a series of novels written by Lawrence Block about an alcoholic and former private investigator Matt Scudder. In order to write the adaptation, Frank had to change the original setting and borrowed a different opening scene from one Block mentions in another book in the thrilling detective series. “So I wanted something that started off with a bang where you saw this man and you kind of got one sense of him,” he said. Screenwriters must learn to say much with very little. “That’s exactly what a script should look like,” he said. While writing an adaption for a novel, Frank does not collaborate with the author. “I want the author to like me; I don’t want them to help me,” he said. For Get Shorty, Frank had to invent at least half the story for his script, a huge departure from the novel. “I realized for the movie, for the story that I wanted to tell — not all of it’s in the book,” he said. The same rule applies for his current project. This year he plans to direct a movie loosely based on a German children’s novel, set inside a little village in Ireland. “It’s about a flock of sheep who solve the murder of their shepherd. He has read to them every night from Agatha Christie because he’s a lonely, sad guy. They’ve heard every Agatha Christie story there is so they believe they’re up to the task,” he said. Frank hopes to cast Liam Neeson to play the shepherd and Emma Thompson to voice the smartest sheep, Miss Maple. Craig Mazin wrote the adaption for the 2008 book, Three Bags Full: a Sheep Detective Story, written by Leonie Swann and translated by Anthea Bell. “The sheep can choose to forget things and any time something bad happens, like death, they all choose to forget. So they never realize that through our memories is how we actually keep people alive,” he said.